At my tot's school, Sometimes parents can bring special snacks and I decided to bring some cupcakes. I usually bake this cake into a bundt cake with glaze and chopped nuts but for those little hands, I made them into mini cupcakes. And as they're for school snack, I sprinkled some cinnamon instead of chopped nuts. At pick up, I peeked in and my tot put a whole lot of stickers on the paper in front of him and asked one of the teachers to take pictures of him with the stickers. She asked me if I take pictures a lot. Haha Uh..yes..of him and of food. It's funny how he feels so comfortable with his teachers now, he even asks them to take pictures. This boy...Anyway, he said everyone enjoyed the cupcakes except one kid. I said, really? He didn't like the cupcake? And my tot goes, well..he spitted out vanilla cupcake last time too. Okay, that makes me feel better! These cupcakes are so moist and pumpkinny. But not with overpowering pumpkin flavor. I always WANT to like pumpkin flavor but I don't love so many fall treats out there that are way too overpowering. This to me, is just enough pumpkin and the spice. * Makes two dozen regular sized cupcakes. 1. Preheat the oven to 350F. In a bowl of stand mixer, add sugar and eggs. When well incorporated add oil and vanilla extract. 2. Mix rest of the dry ingredients in a bowl and add it to the sugar mixture. Mix until well incorporated and add pumpkin puree. 3. 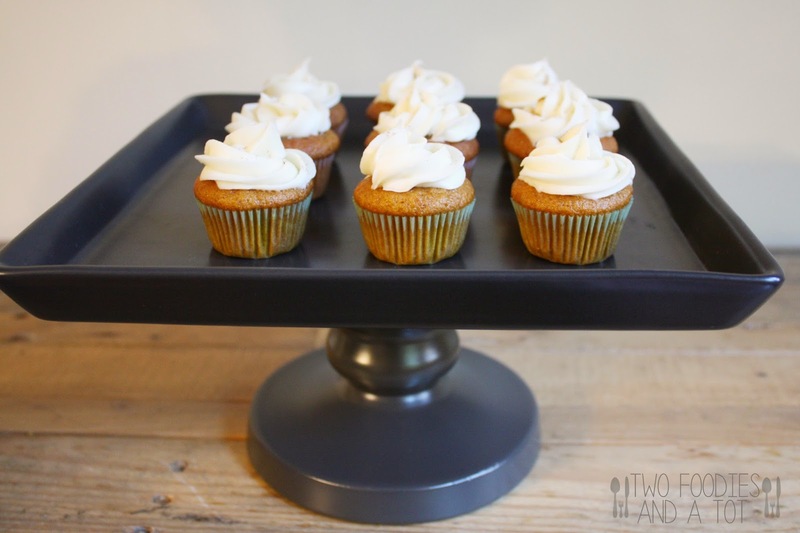 Line the mini cupcake pan or cupcake pan and scoop the batter evenly. 4. Bake for 15-17 minutes for mini cupcakes, 20 minutes for cupcakes. Or toothpick inserted in the middle comes out clean or with a few crumbs. Let cool. 5. 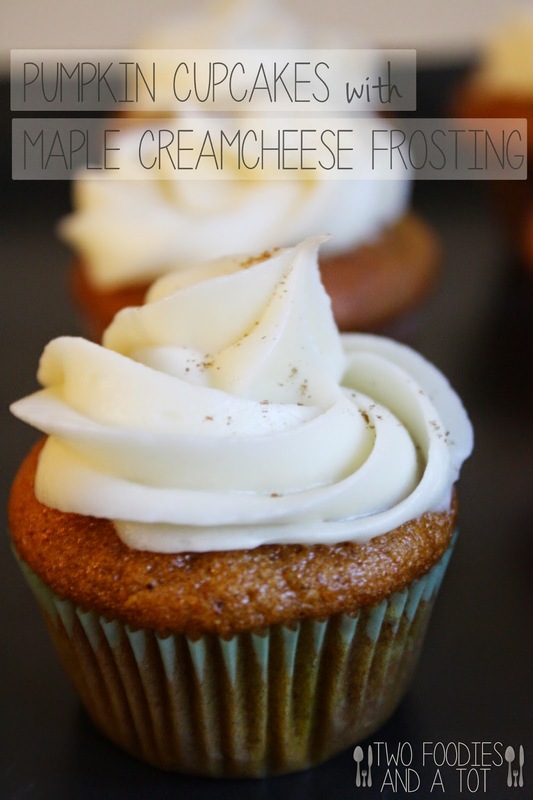 Make frosting - Cream the butter and cream cheese together and add maple extract. Mix in confectioner's sugar. 6. Pipe the frosting on the cooled cupcake and sprinkle some cinnamon on top if desired. * Cake recipe adapted from Lickthebowlgood.